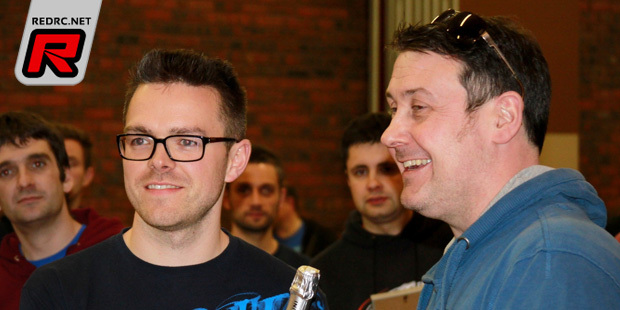 Round 4 of the 2014/15 BRCA 1/12th scale Nationals took place at Crewe last weekend. A track which combined fast, sweeping bends with a tight and technical infield section proved to be challenging for drivers but also very good for providing some close, clean racing. The weekend is split into two separate race meetings, with classes for 13.5 and 10.5 Stock on Saturday and 10.5 and Open Modified on Sunday. 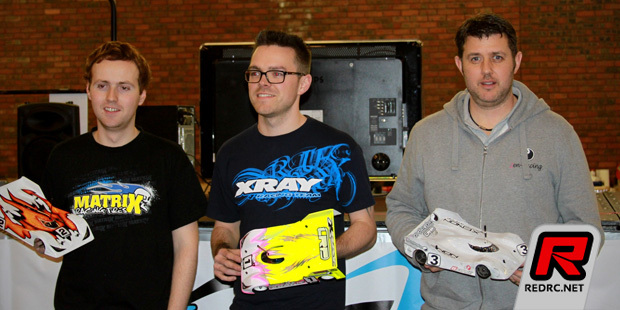 In the 10.5 Stock class, Olly Jefferies was top qualifier driving his LRP powered Xray chassis. He didn’t have things all his own way though as the chasing pack appeared to be much closer to him than at previous rounds. Andy Murray qualified 2nd on the grid also driving an Xray; his best BRCA national qualifying result to date. Andy was pushed hard by David Spashett, whose Zen-Racing chassis was less than 0.2 seconds adrift in third. The A-final saw a controlled, lights to flag victory for Olly. He was never seriously challenged during the 8-minute encounter and a mistake-free run saw him cruise to the win. Olly was helped in some part by a battle between Andy Murray and Dave Spashett for 2nd and 3rd place, with Andy just getting the measure of the multiple former world champion to make it an Xray 1-2 at the finish. Yokomo/Reedy driver Mark Stiles suffered an appalling start and found himself at the tail end of the field from the beginning, but a patient recovery drive saw him recover to 4th by the end, albeit a lap adrift of Olly. Adam Walker-Catchpole had similar woes and followed Mark up through the field to 5th place with his Mobgums shod On-Point car. 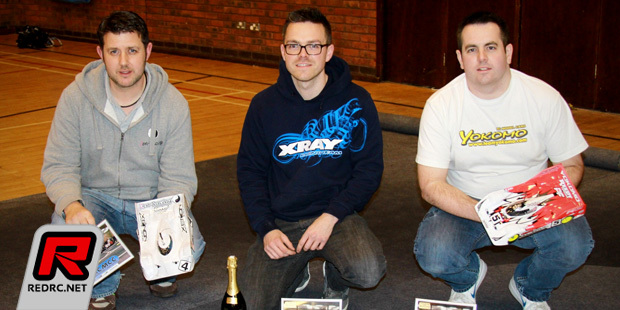 Olly’s win clinched him the 2014/15 BRCA National Championship in the 10.5 class; a perfect score of four wins from four events means that his points haul cannot be beaten by anyone with two rounds left to go. In the 13.5 class, Leigh Dibble was top qualifier driving an Orca powered Zen-Racing chassis. He was never seriously challenged during the final and ran out the comfortable winner. James Wright was impressive throughout the day and scored his first BRCA national A-final podium in 2nd, with rising star Olly Payne completing the podium for Zen-Racing. Sunday always sees faster motors and more grip. There were slightly fewer “really fast” motors at this event though – only 9 entrants in the Open Modified division. Albeit a small field, it was one that contained most of the fastest drivers at the event so would still be very competitive. In Open Modified the pacesetter was once again Jefferies, but a new challenger to Olly’s superiority emerged in the shape of Adam Walker-Catchpole. Adam has recently benefited from the technical assistance of his Mobgums tyre sponsor Markus Mobers who came over to the UK for the previous round, and he put that new found knowledge to good use with a superb run in the last qualifier driving his On-Point car. Adam led the race at times and the pair were nip and tuck for the entire run. In the end it was Olly who came out ahead by just 0.2 seconds to take TQ. The other usual protagonists were also closer to the head of the field than we have seen so far this season; Andy Murray, Dave Spashett and Mark Stiles rounded out the top-5 and even Mark was just 7 seconds off of TQ pace. The A-final looked like being a cracker, with Adam a genuine contender for victory. Unfortunately that anticipation was short lived, as a first lap coming together between the lead pair dropped Adam into the middle of the pack. Mark Stiles picked his way through the accident to find himself in 2nd position after the first lap, only a few car lengths adrift of leader Jefferies. Olly’s pace was too much for Mark though and despite holding onto Olly’s coat tails for the first 2 minutes, a minor error resulted in the Yokomo driver falling away from Olly’s tail, allowing the Xray star to settle into a comfortable rhythm and pull away. Later in the race David Spashett got past Mark and into 2nd, and that’s how the order stayed for the remainder of the 8 minute race. Following his first lap collision with Jefferies, Adam Catchpole managed to recover to 4th place, with Andy Murray completing the top-5. The top-5 cars all remained on the lead lap and in turn were over a lap ahead of the 6th placed car; such was the relentless pace being set by the front running drivers. Qualifying in the Sport class was dominated by Mick Farrell, who had switched over from open modified for this round. Mick put his Trinity powered CRC chassis on pole for the A final ahead of Aidan Ripley’s Xray. Mick suffered some bad luck in the final though, as a marshal accidentally impeded his progress whilst crossing the track, resulting in Mick falling down into the middle of the pack. This left the door open for David Gale to come through and take a popular win with his Team Associated chassis. Youngster Aidan Ripley was a fine 2nd ahead of top qualifier Farrell, who mounted a spirited recovery following his early misfortune.